These are little bowls of heaven, so creamy and rich. Preheat oven to 400 °F (205° C). Coat 4, 6 oz ramekins with butter flavored cooking spray. Place on a baking sheet. Fold 1/3 of egg whites into banana mixture. When incorporated, fold in the rest of the egg whites. Spoon mixture into ramekins. 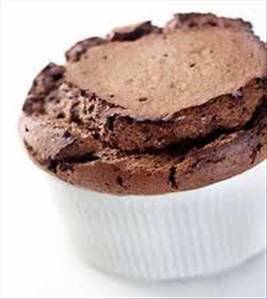 Wipe the top 1/4 inch “collar” of the ramekin to remove any excess batter so that the souffle will rise straight. Place ramekins on a baking sheet. There are 118 calories in 1 serving of Chocolate Banana Souffles. Calorie split: 7% fat, 83% carbs, 11% protein.